What a fishing week this past one has been and again always feel so blessed to live in British Columbia “The best Place on Earth” . 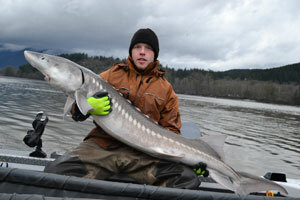 From Sturgeon fishing to Trout fishing with warming temperatures the fishing is just getting better and better. The year started early with my friend Geoff, Sturgeon fishing addict extraordinaire wanting to come fishing in January. It was winter I said “are you nuts” to which he replied, “my friend and I have time off and this is when we can come, we know the fishing will be okay, we will take our chances.” I agreed and probably gave my head a shake at the same time. 2011 has been another busy year and hopefully over the next months I can go over some of the many highlight trips of my 2011 season and possibly throw in a report or two along the way to keep all of you tuned into what is going on in our local rivers. 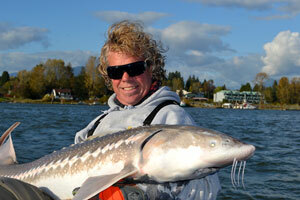 As the Fall season is fast approaching this means nothing less than absolutely epic Sturgeon fishing and Salmon fishing. Trips in the last have been catching lots of fish and everyone is leaving with Salmon for the BBQ and great photos to share with friends!! My Great friends and clients came up in mid August for a visit with my fishing buddy Hunter from Texas – Larry and Ann Fuline have been such good grandparents to invest time to show Hunter a few great trips here in Canada chasing our favourite river Dino’s. Both Jake and Bill wanted to do something special for their Dads 60th Birthday and both regularly visit a local tattoo shop Inkubus Tattoo in Grande Prairie when they seen some pictures of big Sturgeon caught by Steve Mills (owner of Inkubus) daughter and son on their many trips to our area over the years.